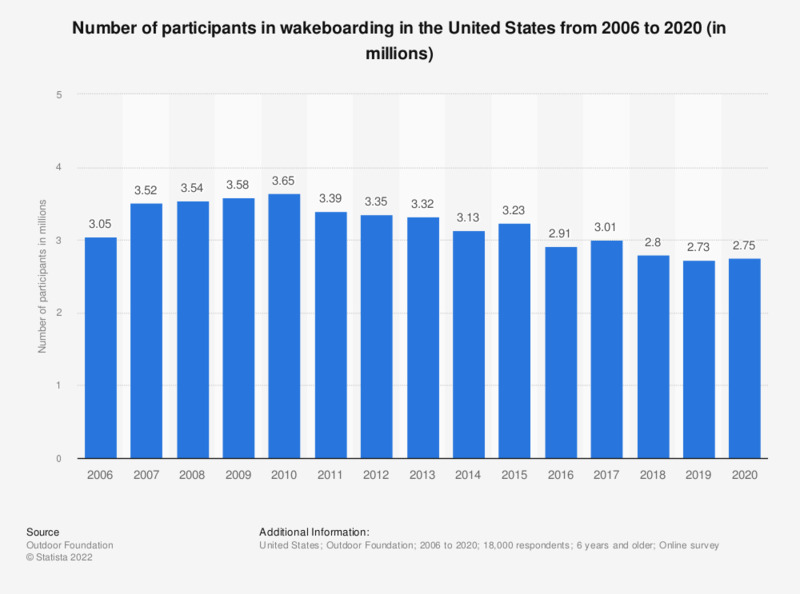 This statistic shows the number of participants in wakeboarding in the United States from 2006 to 2017. In 2017, there were approximately 3.01 million participants in wakeboarding. Water sports such as wakeboarding, surfing, snorkeling, scuba diving, canoeing, kayaking and rafting draw millions of participants in the United States each year. Boating for recreational purposes is also very popular. At least 50 million people participate in recreational boating every year in some way in the United States, using a boat for activities such as water skiing, fishing and/or travel. Wakeboarding, for example, drew 2.91 million participants in 2016. 820 thousand of these participants were youths (aged 6 to 17 years) and about 572 thousand were young adults (aged 18 to 24 years). In 2017, there were 11.96 million registered recreational boating vessels in the U.S.